**Spattered pink 180g wax in UV gloss finished sleeve. Edition of 350** "Andrew Liles' 'Wanton Wives...' follows on from where his 'Maleficent Monster' left off in June and also follows on from his recent Equestrian Vortex soundtrack 10" on Death Waltz. This, the second LP of horror inspired nastiness in his series for Blackest Rainbow, features creeping giallo jazz with sultry spoken vocals, synth heavy monsters, cannibal lunacy, and a track called 'Wild Boar', wait until you hear that one. This is the sound of someone who has spent too many late nights watching any horror films they can get their hands on. 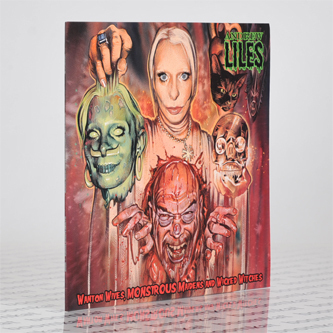 Legendary UK artist Graham Humphreys returns to create new art, this time featuring Liles bursting from his poor wives chest whilst she grasps a skull and a decapitated head of a voodoo priestess version of herself. She endures a lot…"